Our publications include a tri-annual newsletter, a newspaper column on family histories called “Ancestors’ Attic,” a compilation of local Bible Records, and the Mayhew Family History. We have several other books in the process of publishing that we hope to have available for sale soon! A subscription to the Genealogical Society of Salem County's tri-annual newsletter, the Fenwick Colony Gazette, is included with membership dues. The newsletter has been in print for over 20 years, and it includes genealogical queries, lists of upcoming events, extracted genealogy data, and helpful hints and suggestions. Digital copies of the recent newsletters are available online for members, while older issues are stored at the archives. The "Ancestors' Attic" newsletter column runs in the Elmer Times every few months. Each article traces the family history of a different South Jersey family. The articles are written by Bonny Beth Elwell, president of the Genealogical Society of Salem County. Below is a complete listing of the articles that have been published, with links to those that have been digitized. 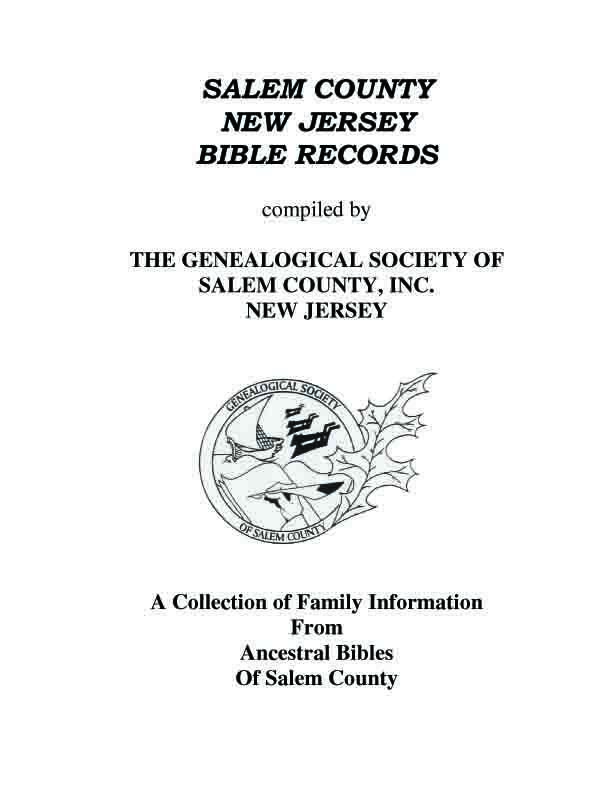 The Genealogical Society has published a compilation of family information from ancestral Bibles of Salem County, entitled Salem County, New Jersey Bible Records. Copies of this almost 200-page book are available for sale for $20. It includes an index of names. For more information on purchasing a copy, please see our store. We are also welcoming additional Bible Record data, as we hope to publish a second volume of records. If you have any old Bibles in your possession, please scan or xerox copy the relevant pages and send us the information! Thank you for your assistance in preserving these fragile records. 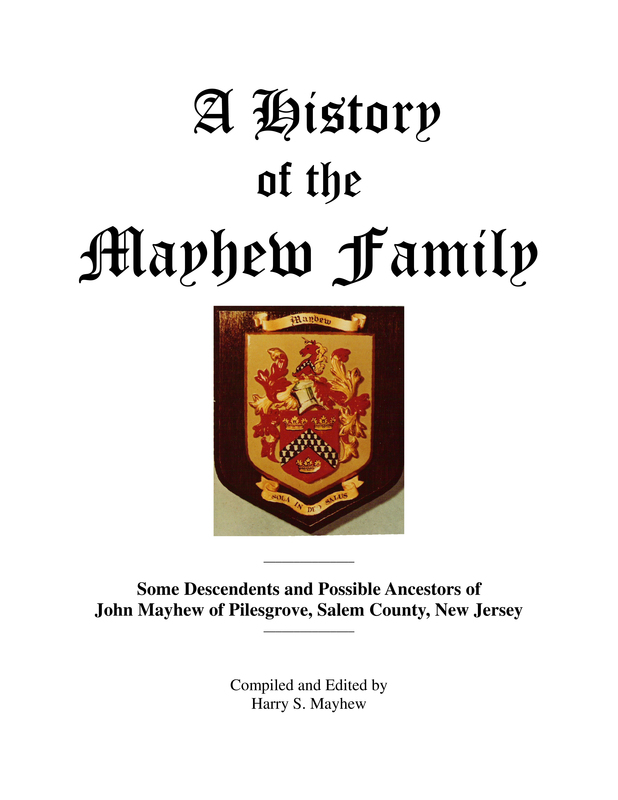 This extensive history of "Some Descendents and Possible Ancestors of John Mayhew of Pilesgrove, Salem County, New Jersey" was written by Harry S. Mayhew after decades of research. The book comes in two volumes: the main text and the appendices full of deeds, wills, censuses, cemetery records, etc. The extensive appendices to Harry S. Mayhew's history of "Some Descendents and Possible Ancestors of John Mayhew of Pilesgrove, Salem County, New Jersey" includes transcriptions of deeds, wills, censuses, cemetery records, and many other records. Because of the size of the books, we print it by special order. Each volume costs $25, or $50 for the set.